A few months back, I was on Pinterest (shocker!) and I came across this situation called a Capsule Wardrobe. I actually wasn’t too interested at the moment, but I pinned it and decided I would just come back to it later. In the past, I have had issues with shopping. I think most people have kind of the same issues that I do, and we just don’t know how to deal with it. I was at Hollister, and I saw this gorgeous blue lace skirt. I never wear navy blue, and I didn’t have a reason to purchase it, but it was on sale for 7 bucks, so I figured why not, right? It’s been over a year and I don’t even know where that skirt is. I never wore it, and it probably still has the tags still attached, wherever it is. This happened again at Nordstrom rack. I saw this gorgeous floral maxi skirt, and it was on sale, so I snatched it up and never wore it. At least I know where it is, though. The point is that I have a legitimate shopping problem. I buy things for no reason, just because they are super cute and on sale. Then when I want to wear it, I end up choosing something else because I don’t have a cute top or shoes that will go with the skirt. It’s out of control, I know. This will be my first time creating one, so I have no idea how it is going to go, but we will see! This is also something I want to incorporate in to my kids wardrobe as well. If you follow my blog at all, you may already know that I am really working on living a more minimal lifestyle. And that includes shopping. This is where a capsule wardrobe comes in to play. A capsule wardrobe, is a collection of timeless, basic, clothing items that can be worn in multiple different outfits. 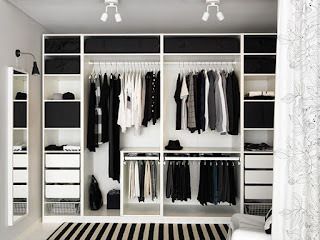 This helps prevent buying items that you will never wear, and it helps with the “I have nothing to wear” issue as well. How Do I put together the perfect Capsule wardrobe? Step 1: Cleanse your closet. First, you need to clean out your closet! Yes, there will be some hard labor involved in this process. Go through each item in your closet. If you haven’t worn it in a couple of months, chances are you don’t need it. Get rid of everything that you do not need or want any more. What is left? What are the colors you wear the most? Are you more of a casual person, or do you like to dress up? You will have to take note of these things. Since spring is coming up, I am going to build my dream capsule wardrobe right now with you! I swear, I’ve never done this before so we can learn together. Do you work in an office all week? Do you go to the gym frequently? Do you dress casual most of the time? Figure out what kind of clothes you will be needing for your lifestyle. Step 3: Make a mood board. Now you know what pieces you are looking for. Step 4: Analyze what’s left of your wardrobe. So you’ve already done away with the pieces of your wardrobe that you don’t wear. So what is left? Can you use those pieces in your capsule wardrobe? For me, I am good at purchasing timeless clothes, so I already have some solid skirts, and tops. I think I could use more dresses and jeans, and maybe some spring sweaters. Any other kinds of jackets, fitness wear, tights, etc. These are just ideas, Customize it any way you like, but most people stick to a 40-50 piece collection max. Now it's time for the fun part! Go shopping for the remaining items that you need to complete your wardrobe. You will find that once you complete the shopping you should have a solid wardrobe full of timeless pieces that you can wear tons of different ways,! I will be adding my own photos at a later date, but here are some capsule wardrobes I found on Pinterest! I actually found it difficult to find the items that I needed. I found balmain white tees for $200 but it was hard for me to find affordable pieces for a graphic. I will be shopping for my spring wardrobe over the next couple of months and I'll try and update with how I planned it out. Is this something you would try? Let me know in the comments! Have you joined my Facebook Group for fashion, beauty, lifestyle, and travel bloggers yet? If you are looking to promote your posts, grow an engaged audience, and get freebies and awesome blogging resources then this group is for you! I love the idea of a capsule wardrobe and of a "personal uniform". Makes dressing your best, even casually, so much easier.